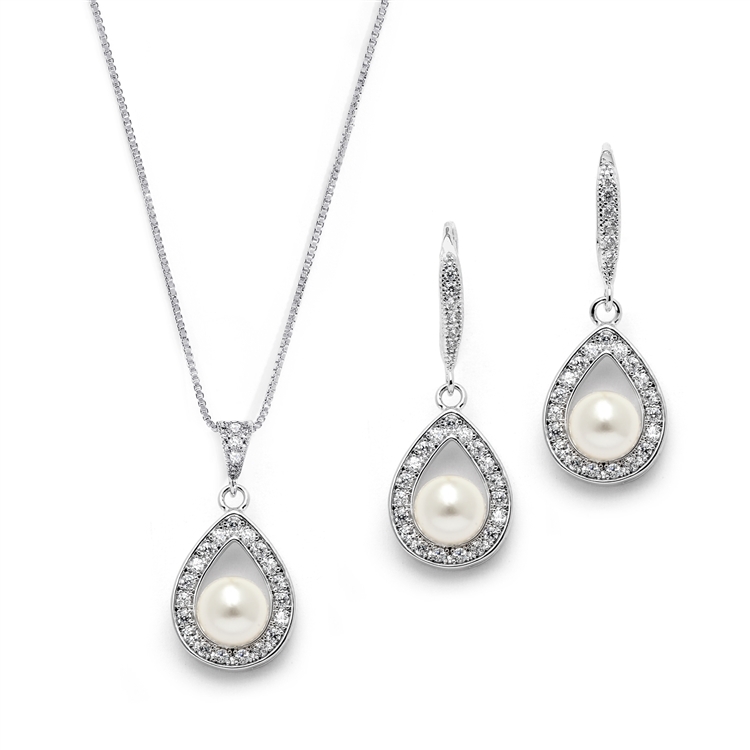 Mariell Classic Style Silver Rhodium Wedding or Bridesmaid Necklace and Earrings Jewelry Set Features a Cubic Zirconia Pear-Shaped Frame Design with 6mm Round Ivory Pearls. This set is guaranteed to add a touch of class to any wedding at a great price! Mariell's classic silver bridal or bridesmaids necklace and earrings set has an elegant cubic zirconia embellished pear-shaped frame featuring a dainty 6mm ivory pearl. This Genuine Platinum plated jewelry for brides set has an adjustable 16" to 18" necklace with a soft creme glass pearl set in a 7/16" wide pendant. The matching french wire back earrings feature matching 6mm pearls and are 1" high. This set will add a touch of class to any wedding or evening out at a fabulous price! Lifetime Guarantee. We promise you'll love this top selling pearl and Zircon necklace set or your money-back. With understated elegance, this set offers you maximum enjoyment as it seamlessly flow from evening wear to business wear. Treat yourself or someone you love to this timeless pearl jewelry set from the Exclusive Mariell Collection of Bridal and Special Occasion jewelry for women....at a super affordable price.